Baltimore Mayor Catherine Pugh said she is taking an indefinite leave of absence because of pneumonia, as she faces growing pressure over revelations that she sold her self-published “Healthy Holly” children’s books to the University of Maryland Medical System while she sat on its board of directors. Ms. Pugh, a Democrat elected in 2016, made the announcement hours after Republican Gov. Larry Hogan called for the state prosecutor to investigate the medical system’s purchase of 100,000 “Healthy Holly” books for $500,000 since 2011. Ms. Pugh previously said she returned $100,000 to the system, one of the state’s largest private employers. “The people of Baltimore are facing too many serious challenges, as it is, to also [have] to deal with such brazen, cartoonish corruption from their chief executive,” he tweeted. Ms. Pugh said last week that the deal with the medical system had been a mistake. “I am deeply sorry for the lack of confidence or disappointment which this initiative may have caused Baltimore city residents, friends and colleagues,” she said at a news conference Thursday, after being released from the hospital where she was treated for pneumonia. Her office’s statement on Monday said Ms. Pugh has been battling pneumonia for the past few weeks. Ms. Pugh resigned from the University of Maryland Medical System board last month, after the Baltimore Sun published an article exposing the deal. On Monday the Sun reported that health provider Kaiser Permanente also bought Ms. Pugh’s books, and that some were purchased during a period when the company successfully sought a contract to provide health benefits to Baltimore city employees. 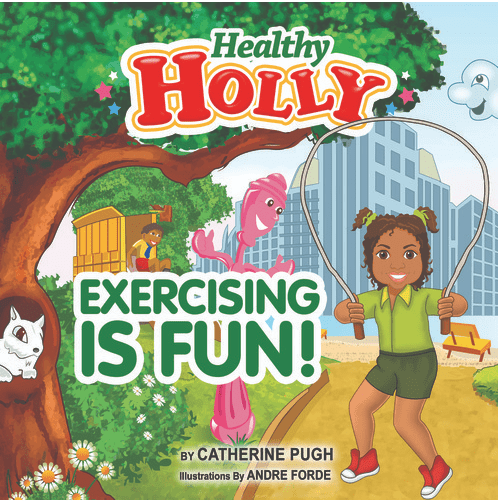 A spokesman for Kaiser told The Wall Street Journal it has purchased 20,000 copies of the “Healthy Holly” books for $114,000 since 2015, delivering them to back-to-school fairs, elementary schools, day-care centers and religious institutions. It said it bought them from Healthy Holly, LLC. This post is strictly my personal opinion about something I care deeply about—children’s books—and view as having saved my life as a child. I have loved children’s books for 57 years, 28 of them as a bookseller. It is no accident that children’s books are filled with portals leading to other dimensions, wardrobes and tesseracts, Platforms 13 and 9 and ¾, Neitherlands and multi-verses maintained by nine lived enchanters. These passageways are metaphors for those real-world portals into other dimensions, books themselves. We know from books of wonder that accesses to magical portals are periodically threatened by a variety of evils. These ills are sometimes the results of mistakes made by heroines and heroes, other times by ill will or the return of an ancient malice. We know too what must be done. Mistakes need to be set right, access to the portals preserved, whether through some manner of renewal, or by the beating back of a constricting malice. That is the heroine’s task. In many ways our own multi-verse of books has been in a kind of golden age these last few decades. We have enjoyed an array of splendid new, entrancing, and increasingly diverse and inclusive worlds made available to readers alongside well trodden older doorways into realms whose pathways, castles, battlefields, museums, and gardens still beckon, beguile, and enrich. We also know that evils often appear just when the sunlight is brightest. And so it is now, that a potent threat has manifested. If we were to encounter, in the pages of a book, a maleficent communal voice which, with the heavy prongs of fear and public shaming, enforced an orthodoxy of perspective that constricted what people could write about, which consigned their identities to ethnic and racial attributes, that rewarded conformity and castigated dissent, we would know what the heroine’s task was. She would fight for what is truly important, creativity, social justice, imagination, liberty, a robust forum for dissenting opinions, for individuality and personal association and expression. The force with which our heroine is confronted is currently being animated through Twitter. There has been a series of Young Adult books whose authors were pressured or, if you like, edified into submission, to remove their own books from pending publication. The pace of these removals is increasing. There have been two in the last several weeks, Blood Heir and A Place for Wolves. More are likely on their way as other people find problems in books and exert force on authors to remove their own work from imminent publication. There is an enforced narrative at work here which demonizes dissent while rewarding compliance. Free speech advocates are lumped together into a composite persona, that of privileged people yelling censorship to maintain their privilege. Authors who pull their books are doing so because they are brave not because they are being held under water and desperately looking to get back to the surface. When your personal identity is in the hands of other people you will do most anything to preserve your safety. It is no coincidence that the two most recent authors to pull their books from publication were themselves active YA Twitter members. Both of them have been involved in argumentation within the Twitter community, and both were more susceptible to being flamed and dragged in an environment their identities were already embedded in. 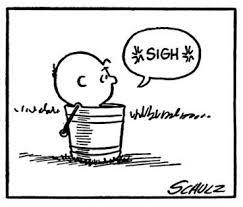 This toxic environment is reinforced by pressure for people to stay in their racial and ethnic lanes and to adopt the opinions of others which have been granted imprimatur by virtue of authenticity. What Books Will Boost Self-Confidence in My 10-Year-Old Son? Q: What books would help instil confidence in a preteen boy? The act of reading can itself create an oasis of calm in a busy world, and I believe children’s fiction can play a powerful role in building confidence and resilience. Look for stories showing characters facing and overcoming fears and persevering in tough times. SF Said’s modern classic Varjak Paw, with wonderfully menacing artwork from Dave McKean, is about a young cat on a voyage of discovery and self-acceptance in the big city, replete with martial arts and terrifying villains. Another thrilling tale of bravery is Katherine Rundell’s epic adventure The Explorer, last year’s Costa children’s book of they ear. Four children lost in the Amazon jungle face a compelling physical struggle to survive while each facing their own, more personal battles. Nonfiction may also offer inspiration. In Stories for Boys Who Dare to Be Different, Ben Brooks looks beyond the stereotypes, at a diverse selection of male lives, from Lionel Messi to Barack Obama and Daniel Radcliffe. PG would add The Dangerous Book for Boys to this list. 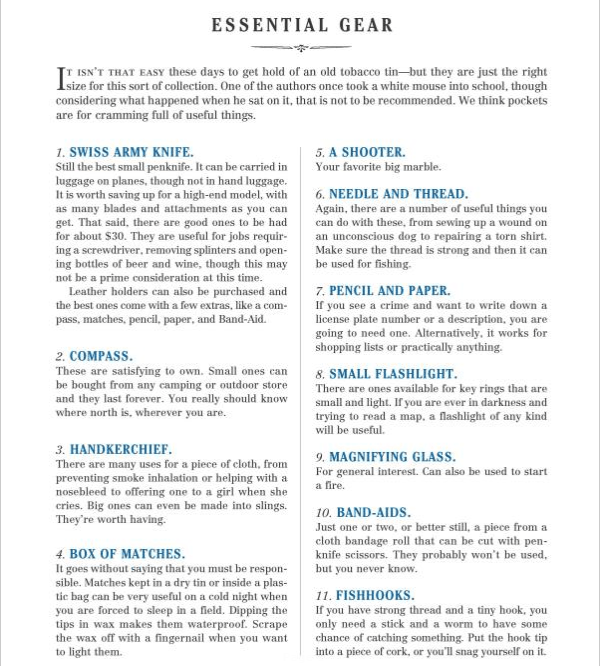 As a former boy of a certain age, PG can attest to the attractiveness of the items on this list to such a boy, not necessarily because they’re essential for specific tasks, but rather because they’re highly beneficial for the imagination of such a boy and contribute to his self-confidence. If a boy is prepared to write down a description of a crime he might witness, even in the tamest of neighborhoods, he becomes more observant and feels a bit of mature responsibility for the safety of others. A small flashlight will keep him amused for hours and he will certainly use it to examine a map, even one he draws himself, in the dark or perform a late-evening security check of the perimeter of his home. Today (January 25), Amazon Publishing–which is the trade publishing house, not the self-publishing platform–has announced the creation of a new children’s book imprint: Amazon Crossing Kids. The new imprint will focus on picture books in translation for children. Needless to say, Amazon Crossing Kids has the benefit of a powerful and much-appreciated sibling imprint, Amazon Crossing, which today is the world book industry’s largest and most aggressive publisher of literature in translation. Amazon Crossing Kids may be welcomed by the translation community as a new chance to get culturally and thematically diverse content in front of the youngest readers. In a prepared statement, the publisher of Amazon Publishing, Mikyla Bruder . . ., says that the new development “blends the missions of Amazon Crossing and Two Lions by introducing terrific books from around the globe to readers who are beginning to develop their worldview. Led by editorial director Gabriella Page-Fort, Amazon Crossing has broken the translation barrier for many readers by using some of the business’ most skilled and best-known translators and by offering genre literature as well as literary fiction–a way to attract consumers to the work by genre rather than by language or cultural background. The imprint doesn’t shy from literary fiction, but features historical fiction, romance, mystery, thrillers, and other work that great translation houses in the past tended to eschew. The same understanding of the market can be expected to inform the new Amazon Crossing Kids imprint. Skea will work with Page-Fort and with Two Lions editor Marilyn Brigham. The project is to engage a pool of authors, illustrators, and translators from many parts of the world.